Conlon celebrates Saturday's All-Ireland win against Cork. CLARE FORWARD JOHN Conlon says their All-Ireland hurling final replay victory was down to a relaxed approach, a strong start and the influence of Davy Fitz. The Clonlara attacker says he and his teammates have the ability to win more trophies, having realized they have nothing to fear against the other counties. In the short term, they will just be enjoying last weekend’s success. Conlon reveals that apart from the normal pre-match nerves, Clare were largely very relaxed in their approach to the replay. The 24-year-old thinks that attitude was down to the youthful element of the squad. “We were on the train on the way up and the train driver, he was a Clare man and had the jersey on leaving the train anyway, but he just remarked to me at the back of the train that he had never seen so many lads as relaxed. I’d say there were two or three games of 45 going on and different little games. A strong start saw Clare race into an eight-point lead on Saturday, and dominant opening spells have been something of a specialty for the Banner this season. Conlon, who scored two points against Cork, says manager Davy Fitzgerald is the key to that. 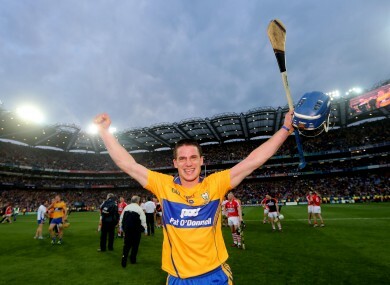 Conlon is of the belief that Clare would never have won this All-Ireland if Davy hadn’t come on board in 2011. The Ennis man highlights the professional set-up the manager has built for the players, allowing them to focus totally on training. “When Davy came in, I suppose I was on the panel two or three years and we hadn’t had much success. I don’t think we had even won a Championship game, never mind winning All-Irelands. It is all down to him and his backroom team, he puts great people around him. I suppose Pat Donnellan was nearly sick of naming out so many people in the backroom team on Sunday. Shane O’Donnell was the star for Clare on the day, scoring 3-03 with clinical efficiency. Conlon says he knew the 19-year-old was going to be in the starting team, but kept it to himself. Whatever about the cruel anecdotes, Conlon wasn’t surprised to see O’Donnell scoring so freely, despite the nerves he suffered before the game. “I think he said to me after the match ‘Jaysus I was about to get sick there going out on the field.’ He didn’t have time to get nervous. He was amazing, he was excellent, he was outstanding – that’s Shane. So what next for this talented young panel? Conlon insists that a hurdle has well and truly been leaped by the Banner, and a lack of belief will never prevent them from competing for honours again. Clare will enjoy this success but won’t be resting on their laurels. “It is a really young panel and there is great talent coming through with the Under-21s winning and great minor teams again. It is up to Davy now to bring all those lads along again and keep everybody happy. I think everyone wants to be part of this panel now because it is going places. “I think a big thing in Clare was that when we first started out we might have been a bit frightened but lads are getting it in their heads now that they can believe in their abilities. People, I suppose, fear these Cork jerseys, fear these Tipperary, Kilkenny jerseys. Email “‘We’ve reached the Promised Land, our dreams have come true’ – John Conlon”. Feedback on “‘We’ve reached the Promised Land, our dreams have come true’ – John Conlon”.